This chart shows companies by highest monthly wages paid to interns in the United States. Being an intern has the ring of financial hardship to it. But, it doesn't have to be that way. Some American companies pay pretty well, actually they pay better than the average wage in the U.S. The median annual salary for a full-time U.S. worker is currently $51,350. If an intern worked at Facebook all year round he or she could make $96,000. 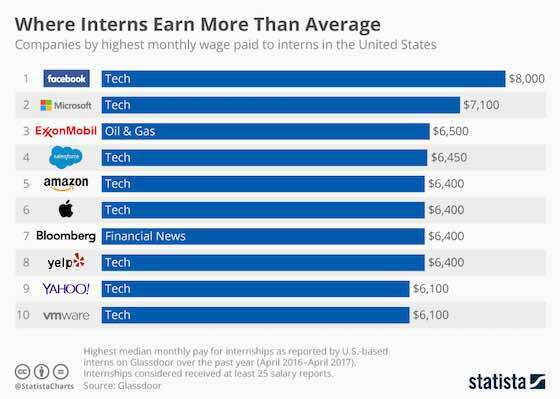 Most of the companies who pay their interns exceptionally well are in the tech business, according to a report by job portal Glassdoor. (ExxonMobil and Bloomberg are the only exceptions in the top ten). Some interns at the top notch tech firms are highly qualified as software engineers, have a MA or even a PhD.